Deutschlands gef&#132;hrlichste Giftpflanzen, mit erl&#132;uterndem Texte, worin ihre Wirkungsart und die wirksamsten H&#129;lfsmittel bei Vergiftungen angegeben sind, nebst einer leichtfaálichen Einleitung in die Pflanzenkunde. Darstellung und Beschreibung der Arzneygewächse welche in die Neue Preussische Pharmacopöe aufgenommen sind. Erster Band. Nach natürlichen Familien geordnet u. erläutert von Joh. Fr. Brandt u. Jul. Theod. Christ. Ratzeburg unter Mitwirkung des ersten Verfassers. M. LV illuminirt. Kupfertaf. Portugal illustrated; in a series of letters by the Rev. W. M. Kinsey, B.D. fellow of Trinity College, Oxford; and chaplain to the right honourable Lord Auckland. Embellished with a map, plates of coins, vignettes, modinhas, and various engravings of costumes, landscape scenery, &c. Second Edition. Fabeln. Zweite vermehrte Auflage mit einem Heft Zeichnungen von M(artin) Disteli. Gouvion Saint-Cyr, Maréchal [Laurent, de]. Mémoires sur les Campagnes des Armées du Rhin et de Rhin-Et-Moselle, de 1792 jusqu?à la Paix de Campo-Formio / Resp. ?Atlas des Campagnes de Monsieur le Maréchal Gouvion St. Cyr depuis 1792 à 1813? (Rückentitel); i.e. Atlas des Cartes et Plans relatifs aux Campagnes (.) pendant les années 1792, 1793, 1794, 1795, 1796 et 1797. 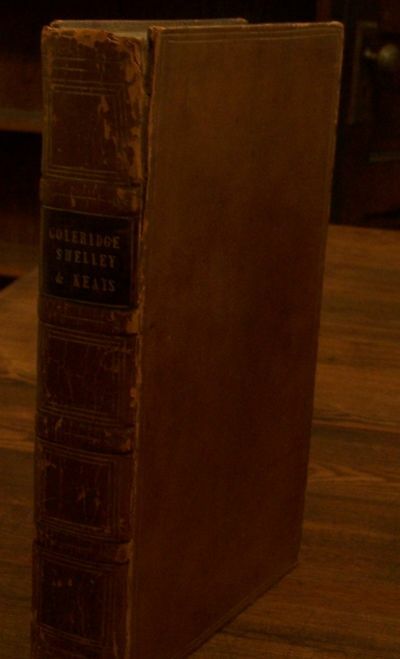 A. and W. Galignani, 1829 Collection of three great Romantic poets Contains many poems published for the first time as it is the first collected edition of both Shelley and Keats, and Coleridge's second collected edition. Beautiful engravings on the frontispiece. Published by A. and W. Galignani. Full leather binding has small splits at top and bottom of spine, edge wear, minor scratches, minor scuffs, rubbed/slightly bumped/slightly frayed corners, rubbed/slightly chipped spine, slightly sunned. Front hinge very slightly cracked. Has owner's bookplate inside front cover (we'll come back to that). There is another tipped in inscription by a different owner on a front free end page and a short gift inscription on the half-title page. A few pages with small chips. Foxing to pages. Small dampstain markings at margins/edges. This book was once owned by the Reverand Frederick Watkins, an English Anglican Clergyman who was also the H.M. Inspector of Schools from 1841-1873 and was also a school friend of Charles Darwin, with whom he corresponded. This is an important work in nice condition. . First Edition. Full-Leather. Very Good-. Ansicht der Commun Gebäude in Potsdam am 13ten July 1829. - kol. Lithographie n. Eduard Gaertner, 1829, 22,5 x 39 Nicht bei Giersberg /Schendel. Drescher / Kroll, Nr. 418. - Sehr seltene Ansicht, entstanden während des Festes "Der Zauber der Weissen Rose" durch Eduard Gärtner ( 2.6.1801 - 22.2. 1877 ). Anlaß des Festes war der Geburtstag der Kaiserin Alexandra Feodorowna von Rußland. Blick über die Communs zum Neuen Palais, im Vordergrund die Spitze des Festzuges. Vor den Communs und auf den Treppen des Neuen Palais tausende von Menschen. Samling af 49 af 50 smaae Landkort i Træsnit til Brug for Skolerne på Landet. [Collection of 49 of 50 small maps in woodcut for the use of the schools in the country]. 1829 1829 - Uden sted / No place 1829. 49 randkolorerede træskårne træsnit. Uindbundet i samtidigt papiromslag. Uden titelblad.49 edge-handcoloured maps cut in wood. Unbound in contp. papercover. No titlepage. * Det ældste danske skoleatlas. S.E. Holm, der var skolelærer, bekostede selv trykning og udgivelse af værket. Atlaset kom i flere udgaver, der hver gang blev udvidede. Værket blev først og fremmest til for at give fattige landsbybørn en forestilling om geografien. Han blev afskediget i 1814 efter at have kastreret sig selv for ikke at få flere børn. Værket er udført fra 1819-29. Bibl. Dan. II, 391. Mangler kortet over det sydvestlige Jylland (Haderslev - Tønder).The oldest danish atlas published by a danish school teacher Holm, who himself paid for printing and publishing the atlas. His main purpose was to give the poor village-children an idea about geography, and it was published in more and each time enlarged editions. The teacher was in 1814 fired after having castrated (!) himself to avoid having more children. The atlas was being made from 1819-29. Missing the map of the south-west part of Jutland. Edinburgh:: Audubon, John James,, 1829.. 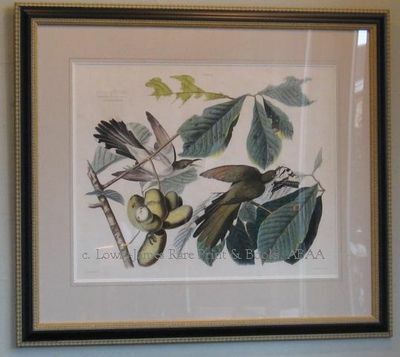 Double Elephant Folio. . Fine original hand-colored copperplate engraving of the second state of the Plate # II from John James Audubon's Magnum Opus The Birds of America. J. Whatmann Turkey Mill 1826 watermark. Plate mark 21 1/8 x 26 5/8. Sheet size 24 3/4 x 30 1/8 inches. Engraved by W.H. Lizars, Edin. Audubon originally and erroneously classified the bird, and thus titled, the first state of the Plate # II Black-Billed Cuckoo, Coccyzus Erythrophthalmus. Subsequently, the bird was reclassified and the text was corrected. The second state of Plate #II shows the proper taxonomy of the bird corrected in fine manuscript. One of the superior 10 plates of the Birds of America engraved by William Lizars for the Double Elephant Folio Edition. Handsomely custom framed in 3" black/ gilt moulding. Sized to 39 x 34 inches. 1829. relié. Bon état. Paris, Chez A. Sautelet et Cie Libraires, 1829. 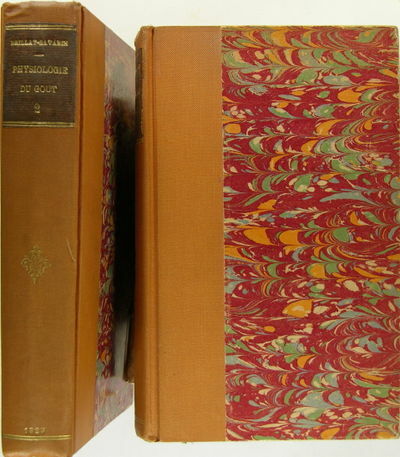 2 volumes In-8, reliure demi-toile orange, dos lisse à pièce de titre, couvertures et dos conservés, tome 1: 419 ; tome 2 : 432 p., 2 frontispices de Henry Monnier. Rousseurs éparses. Cet éditeur fut le premier à éditer publier ce texte anonymement à compte d? 'auteur en 1826. Ce texte est le plus célèbre écrit français sur les plaisirs de la table. Brillat-Savarin qui mourut deux mois après sa publication, ne sut jamais que son ouvrage allait jouir d? 'une telle popularité. Vicaire, 116-117 ; Bitting, p. 60.; Oberlé, 144 ; Simon, p. 218. 1829. Used to Justify Secession Rawle, William [1759-1836]. A View of the Constitution of the United States of America. Philadelphia: Philip H. Nicklin, Law Bookseller, 1829. viii, -349 pp. Octavo (8-3/4" x 5-1/2"). Contemporary sheep, rebacked in period style retaining lettering piece. Moderate rubbing and a few light scuffs to boards, corners bumped and worn. Moderate toning, occasional foxing and faint dampstaining. Early owner signature to front free endpaper, interior otherwise clean. A handsome copy of an important work. * Second edition. 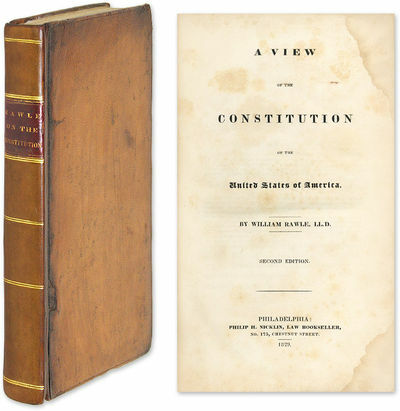 Rawle's treatise is one of the earliest works on the United States Constitution, and one of the most important. This text is significant also because it suggests that states have a right to secede from the Union. As Cohen observes, the popularity of this text, which was used at West Point and other schools throughout the country, "is generally considered to have influenced the leaders and supporters of the Confederacy, although in fact Rawle opposed secession." Cohen, Bibliography of Early American Law 2894. 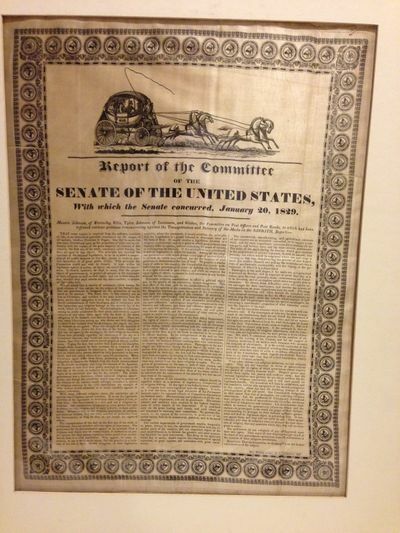 REPORT OF THE COMMITTEE OF THE SENATE OF THE UNITED STATES, WITH WHICH THE SENATE CONCURRED, JANUARY 20, 1829. Messrs. Johnson, of Kentucky, Ellis, Tyler, Johnson, of Louisiana, and Silsbee, the Committee on Post Offices and Post Roads, to which had been referred various petitions remonstrating against the Transportation and Delivery of the Mails on the SABBATH, Report:-- [followed by 14 paragraphs of dense text printed in three columns, each separated by a thin rule]. Baltimore (MD): Wm. Wooddy, printer, (1829). Broadside printed on silk (backed with linen), 51 1/2 x 40 cm. , employing several sizes and styles of type, the entire text and illustration enclosed within a wide ornamental border. The printer William Woody (ca.1788-1863) was active as a printer in Maryland from about 1817; he had served in the War of 1812 as a lieutenant in the Maryland militia (obituary in the Baltimore Daily Gazette, 26 August 1863). Not in Threads of History. Several other versions of this broadside exist; however, we have been unable to find another copy from this printer on either OCLC or in "American Imprints," and none mentioning the illustration of the mail coach. Some light fraying in left and right margins and upper right corner, not touching the decorative border, remains of old glue residue on verso along one side, just a touch of rubbing to border in two spots where the broadside was once folded, one pinhole size spot, affecting a letter or two of text. A bright clean example of a rare broadside, excellent for exhibition. Folded. (#6212) The subject of mail delivery on Sundays was hotly debated in Congress for nearly twenty years (1810-1830), as the post office handled and carried the mail seven days a week during this period. Petitions by various religious groups over these years requested that such work on Sundays be terminated. The text of this Senate report is a distillation of the controversy, and clearly takes the committee's opinion that a Congressional act halting mail delivery on the Sabbath, for religious reasons, would be contrary to the principles of the Constitution. "We are aware that a variety of sentiment exists among the good citizens of this nation, on the subject of the Sabbath day, and our government is designed for the protection of one as much as for another. The Jews, who, in this country are as free as Christians, and entitled to the same protection for the laws, derive their obligation to keep the Sabbath day [on Saturday] … with these different views, the committee are of the opinion that Congress cannot interfere … our government is a civil, and not a religious institution … the transportation of the mail on the first day of the week, it is believed, does not interfere with the rights of conscience. The petitioners for its discontinuance appear to be actuated by a religious zeal which may be commendable, if confined to its proper sphere; but they assume a position better suited to an ecclesiastical than to a civil institution. They appear, in many instances to lay it down as an axiom, that the practice is a violation of the law of God. Should Congress, in legislative capacity, adopt the sentiment, it would establish the principle, that the Legislature is a proper tribunal to determine what are the laws of God. It would involve a legislative decision in a religious controversy; and on a point in which good citizens may honestly differ in opinion, without disturbing the peace of society, or endangering its liberties. If this principle is once introduced, it will be impossible to define its bounds. Among the religious persecutions with which almost every page of modern history is stained, no victim ever suffered, but for the violation of what government denominated the law of God. To prevent a similar train of evils in this country, the Constitution has wisely withheld from our government the power of defining the Divine Law. It is a right reserved to each citizen; and while he respects the rights of others, he cannot be held amenable to any human tribunal for his conclusions." The head of the committee in the Senate, Richard Johnson (ca. 1780-1850) of Kentucky, was praised for this landmark report; his political rise, to nomination as Martin Van Buren's vice-president, followed. Sunday mail delivery continued until after the Civil War, when rapid delivery of news became more a function of modern technology than seven-day a week diligence. Paris: J. B. Baillière, 1829. FIRST EDITION IN BOOK FORM, bound from the original parts n. Hardcover. One of the Great Works of Gross Anatomy,With Impressive Giant Folio Colored Plates. 486 x 337 mm (19 1/8 x 13 1/4"). Two volumes. 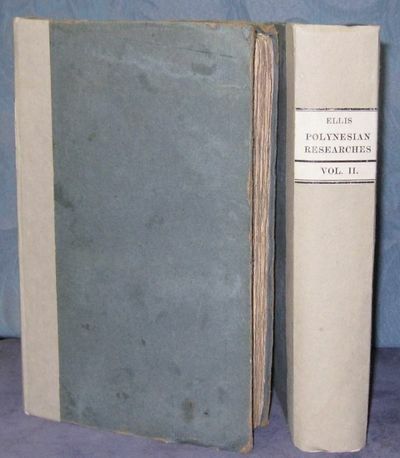 FIRST EDITION IN BOOK FORM, bound from the original parts. Contemporary marbled boards backed with recent calf, raised bands flanked by gilt fillets, black morocco labels. WITH 231 LITHOGRAPHED PLATES (two folding) OF WHICH 167 ARE IN COLOR (many heightened with gum arabic), later tissue guards. Garrison and Morton 2286; "Heirs of Hippocrates" 863; Norman 538. Corners and edges somewhat rubbed with some loss of paper (as expected with large picture books), text with variable foxing (persistent, but usually light, never severe, and principally confined to margins), a handful of black and white plates with moderate spotting, additional small defects internally, otherwise quite a commendable copy of a book always found foxed, browned, and worse, our volumes solidly restored now, the spines unworn, and the text and remarkable plates with no fatal condition problems. Garrison & Morton declares that "the fine illustrations of gross anatomy [seen here] make this one of the greatest works of its kind." The inaugural professor of pathological anatomy in Paris, anatomist and pathologist Jean Cruveilhier (1791-1874) provided in the present work the first description of multiple sclerosis, and an early description of Cruveilhier's palsy. Hypertrophic pyloric stenosis and ulceration of the stomach due to hyperacidity were also described for the first time here. In "Doctrine of the Nerves," John A. Spillane called Cruveilhier "the prince of physician-pathologists" and this work a "treasure chest of neurology." 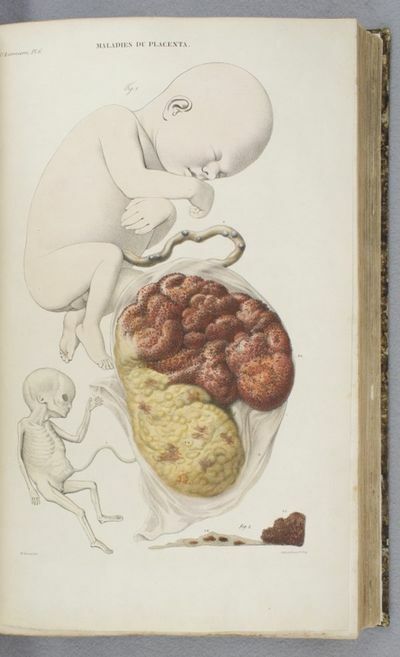 "Heirs of Hippocrates" notes that "this atlas contains some of the finest illustrations of gross pathology ever made." The plates were done by anatomical illustrator Antoine Chazal (1793-1854), a French painter, engraver, art teacher at Muséum national d'histoire naturelle, and great-uncle of Paul Gauguin. This work was originally issued in 40 parts at nine francs each over a period of 13 years. The parts were ultimately bound together into two volumes, as here, in a print run that, based upon the subscriber's list, was likely just more than 400 copies. While no stranger to auction rooms, the book--a practical reference book heavily used by professionals--is all too often found with missing plates and/or parts, and in condition that leaves much to be desired. 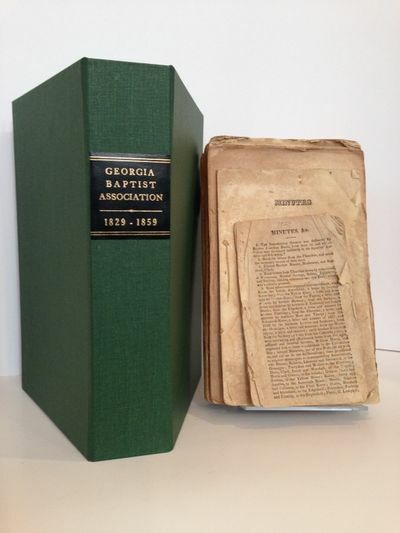 An extraordinary 31-year uninterrupted run of the transactions of the Georgia Baptist Association from its annual conferences, 1829-1859. 31 volumes, all 8vo, all either self-wrappers, stitched, or original printed wrappers (some later issues lacking outer printed wrappers), most untrimmed, most of 16 pages. Places of printing include Augusta (1829-1831 and 1856-1859), Washington, (1832-1840), and Penfield (1841-1855). The De Renne Catalogue describes only eight of the pamphlets in this collection (1841, 1843-1845, 1847-1848, 1851, and 1857). The issues for 1829 and 1834 lack title pages and a few early issues lack their stitching; otherwise a very good lot, all quite scarce in trade. List of individually described pamphlets available on request. London: T. McLean, 1829. Handcoloured engraving, 300 x 410 mm. ; in fine condition, framed. A fine impression of the coloured issue of this rare cartoon, satirising the colony which at this time was desperately trying to attract free immigration. The cashier taking money for the "New Panorama" (probably representing the Colosseum in Regents Park) is shown as if he is selling tickets for a voyage when he is actually selling entrance tickets to one of the fashionably realistic panoramas of exotic foreign places then exhibiting in London. "Do you wish to go to Hell or Botany Bay? Sir" he asks, to which the prospective immigrant replies: "I wonts to go to Bottomy Bay"; a young girl exclaims to her enormously fat mother "La Mama I should like to see the Naughty Place better than any thing".William Heath (1795-1840), originally a career soldier, became well-known as a caricaturist and illustrator. 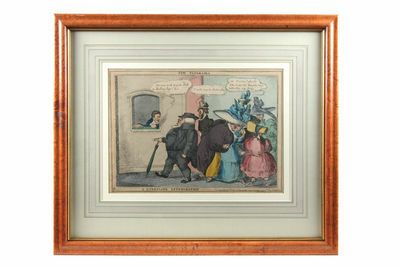 His work reached a wide audience, even outside England: 'on cite aussi de lui des caricatures pleines d'humour sur les moeurs anglaises, vers 1825' (Bénézit Dictionnaire).Separately issued transportation and immigration views are scarce, and this is a particularly charming and amusing example in fine condition. It may be the single caricature by Heath of an Australian subject, though his publisher - Thomas McLean - published material of Australian interest by other artists. Madrid, Imprenta de los Hijos de Doña Catalina Piñuela, 1829. Dos volúmenes en 8vo. ; frontispicio grabado, VIII-387 pp. + fronstispicio grabado, 415 pp. y dos láminas grabadas en cobre. Encuadernación no uniforme, de la época, en media piel y piel marbreada con tejuelos. Andenken an Carlsbad 1872-1873 (Deckeltitel). Sammlung von 12 Originalfotografien (Albumin auf Karton mit typogr. Umrandung, rechts unten Fotografenangabe sowie verso aufgeklebtem Titelschild) v. F. Friedrich u. K. Preuss in Prag, 20,5 x 25,5 cm. Karlsbad, Hans Feller 1873. Fol. (44 x 34 cm). Lose in gold- u. blindgepr. OLwd.-Flügelmappe. . . Vintage Albuminabzüge.- Frantisek Fridrich (1829-92) war ein bedeutender tschechischer Fotograf.- Enth. 6 Fotos aus der Folge "Karlsbad und Umgebung": 10. Totalansicht v. Villa Lützov; 32. Sophienbrücke; 61. Sprudelcolonnade; 69. Alte Wiese; 70. Alte Wiese (anderes Motiv); 79. Hans Heilingfelsen. - 1 Foto aus "Umgebung von Karlsbad": 188. Hauenstein. - 5 Fotos aus "Karlsbad": 27. Sprudelcolonade; 72. Evangelische Kirche; 74. Gemse am Hirschensprung; 197. Blick v.d. Friedrich Wilhelmshöhe; 203. Blick vom Findlaterstempel. - Kart.-Bl. tls. leicht wellig u. etw. stockfleckig, Mappe etw. berieben u. fleckig.# Collection of 12 original photographs (albumen print mounted on cardboard with with glued title label on rear side). A. and W. Galignani, 1829, Full-Leather, Book Condition: Very Good-, First Edition. Collection of three great Romantic poets Contains many poems published for the first time as it is the first collected edition of both Shelley and Keats, and Coleridge's second collected edition. Beautiful engravings on the frontispiece. Published by A. and W. Galignani. Full leather binding has small splits at top and bottom of spine, edge wear, minor scratches, minor scuffs, rubbed/slightly bumped/slightly frayed corners, rubbed/slightly chipped spine, slightly sunned. Front hinge very slightly cracked. Has owner's bookplate inside front cover (we'll come back to that). There is another tipped in inscription by a different owner on a front free end page and a short gift inscription on the half-title page. A few pages with small chips. Foxing to pages. Small dampstain markings at margins/edges. This book was once owned by the Reverand Frederick Watkins, an English Anglican Clergyman who was also the H.M. Inspector of Schools from 1841-1873 and was also a school friend of Charles Darwin, with whom he corresponded. This is an important work in nice condition. Quantity Available: 1. Pictures of this item not already displayed here available upon request. Inventory No: 046688. Paris: Vieilh de Boisjoslin, 1829. Fine. 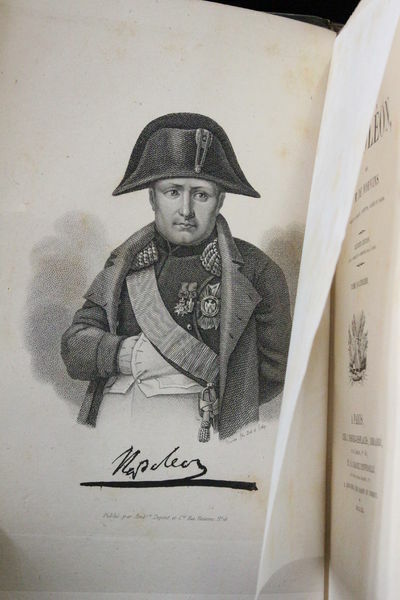 Vieilh de Boisjoslin, Paris 1829, 9x14cm, Un volume in-18 relié. - Third edition partly original rare. Bound in black half shagreen back with four nerves, slightly later binding. Foxing. --- Please note that the translation in english is done automatically, we apologize if the formulas are inaccurate. Contact us for any information! - [FRENCH VERSION FOLLOWS] Troisième édition en partie originale rare. Reliure en demi chagrin noir, dos à quatre nerfs, reliure légèrement postérieure. Rousseurs. Reflections on the Present State of British India. London: Whittaker, Treacher & Co, 1829. The delectable Arcana of Domestic Affairs. First, and only, edition, published posthumously. Engraved frontispiece portrait of Kitchiner, 21 figures to illustrate carving and one illustration of a jelly refiner in text. Pp. iv, 344. 8vo., contemporary calf, rebacked with the original gilt decorated spine laid down, booklabel of the Montefiore family on the front pastedown, a very good, handsome copy. Kitchiner's declared intention is to provide the means "that a young Lady may learn the delectable Arcana of Domestic Affairs...which will enable her to make the Cage of Matrimony as comfortable as the Net of Courtship was charming". The information in the excellent Epicures Calendar has endured with some particularly interesting insights into bread, cheese, bacon, fish, hams &c. Kitchiner (1775?-1827) was something of an eccentric. He was an Etonian who qualified as a doctor in Glasgow and therefore could not practice in England where he lived. He was very wealthy and gave marvellous banquets, of his own devising, at his home in Fitzroy Square. If, however, guests arrived even a few minutes late, they were denied entrance. He introduced the world to his culinary prowess in 'The Cook's Oracle' of 1817, many of the dishes in which he had created and tested himself. 'The Housekeeper's Oracle' was intended to be a companion volume. 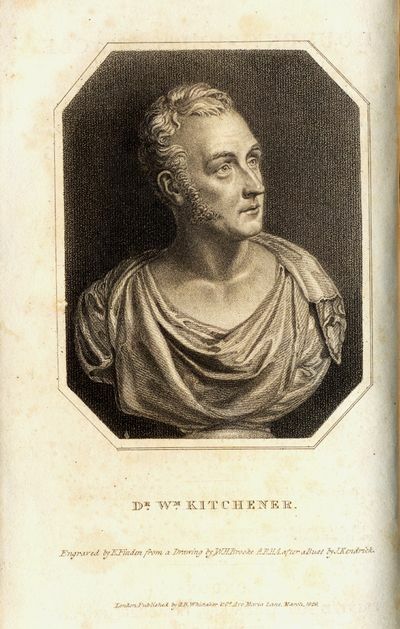 Unfortunately Kitchiner died before it was published and the cause was taken up by his son who had fallen out with his father but was very keen to cash in on his fame. Grundriss der Philosophie für die Vorlesungen am Lyceum von Luzern 1829 - 1830. Philosophische Menschenlehre zur beantwortung der ersten Lebensfrage: " was ist der Mensch? " Wm. Wooddy, printer (1829), Baltimore (MD) - Broadside printed on silk (backed with linen), 51 1/2 x 40 cm. , employing several sizes and styles of type, the entire text and illustration enclosed within a wide ornamental border. The printer William Woody (ca.1788-1863) was active as a printer in Maryland from about 1817; he had served in the War of 1812 as a lieutenant in the Maryland militia (obituary in the Baltimore Daily Gazette, 26 August 1863). Not in Threads of History. Several other versions of this broadside exist; however, we have been unable to find another copy from this printer on either OCLC or in "American Imprints," and none mentioning the illustration of the mail coach. Some light fraying in left and right margins and upper right corner, not touching the decorative border, remains of old glue residue on verso along one side, just a touch of rubbing to border in two spots where the broadside was once folded, one pinhole size spot, affecting a letter or two of text. A bright clean example of a rare broadside, excellent for exhibition. Folded. (#6212) The subject of mail delivery on Sundays was hotly debated in Congress for nearly twenty years (1810-1830), as the post office handled and carried the mail seven days a week during this period. Petitions by various religious groups over these years requested that such work on Sundays be terminated. The text of this Senate report is a distillation of the controversy, and clearly takes the committee's opinion that a Congressional act halting mail delivery on the Sabbath, for religious reasons, would be contrary to the principles of the Constitution. "We are aware that a variety of sentiment exists among the good citizens of this nation, on the subject of the Sabbath day, and our government is designed for the protection of one as much as for another. The Jews, who, in this country are as free as Christians, and entitled to the same protection for the laws, derive their obligation to keep the Sabbath day [on Saturday] with these different views, the committee are of the opinion that Congress cannot interfere our government is a civil, and not a religious institution the transportation of the mail on the first day of the week, it is believed, does not interfere with the rights of conscience. The petitioners for its discontinuance appear to be actuated by a religious zeal which may be commendable, if confined to its proper sphere; but they assume a position better suited to an ecclesiastical than to a civil institution. They appear, in many instances to lay it down as an axiom, that the practice is a violation of the law of God. Should Congress, in legislative capacity, adopt the sentiment, it would establish the principle, that the Legislature is a proper tribunal to determine what are the laws of God. It would involve a legislative decision in a religious controversy; and on a point in which good citizens may honestly differ in opinion, without disturbing the peace of society, or endangering its liberties. If this principle is once introduced, it will be impossible to define its bounds. Among the religious persecutions with which almost every page of modern history is stained, no victim ever suffered, but for the violation of what government denominated the law of God. To prevent a similar train of evils in this country, the Constitution has wisely withheld from our government the power of defining the Divine Law. It is a right reserved to each citizen; and while he respects the rights of others, he cannot be held amenable to any human tribunal for his conclusions." The head of the committee in the Senate, Richard Johnson (ca. 1780-1850) of Kentucky, was praised for this landmark report; his political rise, to nomination as Martin Van Buren's vice-president, followed. Sunday mail delivery continued until after the Civil War, when rapid delivery of news became more a function of modern technology than seven-day a week diligence. Beroaldo Bianchini, Cavaliere Natalis de. Abhandlung über die Feuer- und Seitengewehre, worin die Erzeugung, der Zweck und der Gebrauch aller einzelnen Bestandtheile, dann aller Gattungen kleiner und Jagdgewehre, mit der Angabe und Beschreibung ganz neuer Maschinen und Vorrichtungen, sammt Plänen und Erzeugungs-Tabellen auseinander gesetzt ist. [Und:] Sammlung der Pläne sammt Erklärung zum Behufe der Abhandlung über die Feuer- und Seitengewehre.
. first edition. A Remarkable Suite Of Twenty-Three Hand Colored Lithograph PlatesDepicting a Trip Over Germany and France to ItalyM?-RNER, Carl Gustav Hjalmar. Rese Minnen frän Frankrike Tyskland och Italien af Hjalmar Mörner. [Travel Memories of France, Germany and Italy.] Stockholm: Gjöthström and Magnusson, . First Edition in Book Form. Folio (13 7/8 x 10 1/8 inches; 352 x 259 mm.). Original pictorially engraved gray paper wrapper for part one, bound in as title-page. Twenty-three superb, large hand-colored lithographed plates (of 24), all by Gjöthström and Magnusson after Mörner. Apparently lacking just the single uncolored plate.Bound ca. 1937 by the Lakeside Press, Chicago (stamp-signed in gilt on rear turn-in) in half brown morocco over blue cloth boards ruled in gilt, spine with five raised bands, lettered in gilt in compartments, bookplate of Maxine and Joel Spitz on front pastedown. Some very light occasional marginal soiling otherwise fine. A wonderful lithographic record of the artist's travels over Germany and France to Italy.Provenance: purchased from Helsinfors, Finland, 15 July 1937. Originally published in six parts, each with three uncolored and one colored plate (New York Public Library & Harvard University, Houghton Library)No sale record on ABPC or RBH since Christie? 's Feltrinelli Sale in 1998. The Feltrinelli Library copy whilst complete with twenty-four lithographed plates had just six in color.Excessively rare with only two copies listed in institutions worldwide: The New York Public Library and Harvard University, Houghton Library (both with just six hand colored plates). Not in any of the standard bibliographies although Colas 2141 & 2142 does make mention of the two editions of one of Mörner's other works Scènes populaires de Naples… (1828 edition & 1829 edition).The plates (translated from the Swedish)1. The Public Ball in Paris Montparnasse2. A cabin on the boat to Copenhagen and Kiel3. A Street Scene in Lübeck4. People dancing in Hamburg5. A Water Carrier and a Flower Girl in Hamburg6. A Neopolitan Carriage7. Peasant people between Rome and Naples8. Tyrolean Costume9. A Soldier and a Barber on a Naples street10. Parisian diligence11. Students in Munich12. A Coffee House in Munich13. Wine sales in Paris14. Italian Musicians15. Water sales in Paris16. Italian boulevard in Paris17. 'Slight of Hand' in Paris18. A Horse Drawn Carriage on the way to Paris19. A Funeral Procession in Rheims20. A Robber from Abruzzen21. Dance Improvisation in Rome22. The English Garden in Munich23. The Puppet Theater in NaplesCarl Gustav Hjalmar Mörner, born May 7, 1794 in Stockholm, died September 15, 1837 in Paris, was a Swedish artist. He devoted himself first to the military court and participated in the battles of Grossbeeren, Dennewitz, Leipzig and Bornhöved. As with many other officers at the same time he devoted himself to amateur painting, which is testified by many of his sketches from youth, conviviality and the campaign in Germany. Later he turned seriously to art and traveled in 1816 over Germany and France to Italy, where he stayed until 1828. Mörner tried to paint larger compositions with historical or folklore motifs in oil, but had little success with them. One of the more famous paintings in this genre include Odin's arrival to Sweden's Rosendal Palace. His greatest contribution was made as a draftsman and lithographer. 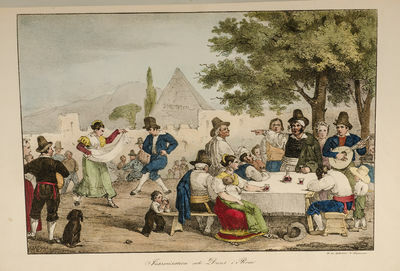 In 1820 he published a series of Roman carnival images in outline etching Il Carnevale di Roma, but these was later transformed into lithographs, which suited his drawing much better, as shown in Italian costume pictures (1825), Scenes populaires de Naples (printed in Naples in 1826, French edition 1828), Travel Memories France, Germany and Italy (1829) and Stockholmska Scenes (1830). During a stay in London from 1830-36, Mörner published a lithographic album, Miscellaneous Sketches of Contrasts (1831). A scheduled work on physiognomy was not completes due to the artist's death in Paris in 1837. Hjalmar Mörner's work is represented in the Gothenburg Museum of Art, ?-stergötland County Museum, Orebro County Museum, and the University Library in Uppsala. Moscheles, Ignaz, Komponist und Dirigent (1794-1870). Hannover, 18. XII. 1829.. 2 SS. auf gefalt. Doppelblatt. Gr.-4to. Mit eh. Adresse am Gegenblatt verso (Faltbrief).. Schöner, ausführlicher Brief an den Wiener Komponisten Joseph Merk (1795-1852): "Sie haben mir recht viele Freude durch [Ihr] freundschaftliches Schreiben gemacht, u. doppelt genoß ich es da ich daraus noch immer den jovialen humoristischen alten Aventure-Kameraden erkannte. Meine Antwort erfolgte so spät weil ich Ihren Brief erst vor 8 Tagen in Hamburg fand als ich von einer großen Reise aus Dänemark und Schweden zurück kam. Es blieb mir daher nur Zeit meine Sinfonie schnell in Stimmen abschreiben zu lassen, und gestern expedirte ich sie per Post an Sie adressirt. Ich hoffe Sie erhalten sie mit diesem Briefe zugleich. Es gewährt mir große Beruhigung daß meine erste Arbeit in diesem Fache durch Ihre Hände der Gesellschaft des. k. k. Oesterr. Musikvereins zur Dedikation angeboten und zur Aufführung gebracht werden soll. Ihre Theilnahme und Freundschaft wird sich gewiß wieder dabey bewähren. Ich erwarte mir nicht daß dieses Werk in einer Stadt wo Haydn, Mozart und Beethovens Sinfonien das Tageslicht erblickt haben, einiges Aufsehen mache; sondern daß meine Freunde sehen mögen daß es mir nicht an guten Willen und Fleiß fehlt, zuweilen etwas besseres zu schreiben, als Bijoux a la Sontag. - Es wäre gut die Stimme in Partitur zu setzen für den Dirigenten, auch die erste Probe mit dupplirten streichenden Instrumenten zu machen, indem die Blasenden sehr stark benützt sind u. ein starkes streichendes Chor erfordern. Das Tempo ist in der Violin 1mo Stimme nach Maelzels Metronom angegeben. Wenn Sie mir über den Erfolg Ihrer Verwendungen etwas werden sagen könnnen, so bitte ich mir nach London zu schreiben [...]. In Copenhagen hatte ich eine angenehme Aufnahme u. spielte bey Hofe, wofür ich vom König eine goldene emaillirte Dose und vom Prinzen Christian einen Brillant Ring bekam. Meine Zeit war zu kurz um in Schweden weiter vorzurücken als bis nach Gothenburg wo ich in der Schnelligkeit ein gutes Concert machte. Grüßen Sie mir Herrn Haslinger [...]". - Moscheles war am Prager Konservatorium Schüler von Dionys Weber, in Wien von Johann Georg Albrechtsberger und Antonio Salieri "und gehörte bald zu den beliebtesten Pianisten und Lehrern Wiens" (DBE). 1825 übersiedelte er nach London, wo er zu den führenden Persönlichkeiten des Musiklebens zählte und als Professor an der Royal Academy of Music und als Mitdirektor und Dirigent der Royal Philharmonic Society tätig war. 1843 verpflichtete ihn sein ehemaliger Schüler und Freund Felix Mendelssohn Bartholdy als Klavierlehrer an das Leipziger Konservatorium. Mit seinem Schaffen zählt Moscheles zu den bedeutendsten Pianisten seiner Zeit. - Kleine Papierdurchbrüche in den Bugfalten; kl. Randausriss von Siegelöffnung (keine Textberührung); eine Bugfalte im Gegenblatt alt hinterlegt. Philadelphia: Published by Henry S. Tanner, 1829.. Engraved map, handcolored in outline, in sections backed on linen. Sheet size: 50 x 63 inches. Engraved by H.S. Tanner, assisted by E.B. Dawson, W. Allen, and J. Knight, with integral decorative title vignette after J.W. Steel. The map is surrounded by numerous small panels including two extensions to the area covered by the map, six more- detailed maps of environs of various eastern cities, eight city plans, a number of elevation profiles of railroads and waterways, and two tables of statistics. Rebacked on linen, expertly conserved by the Green Dragon Bindery. Silk lining edges. Lightly and evenly toned. A very nice copy, in a recent half morocco portfolio, stamped in gilt. The first edition of Tanner's spectacular and very beautiful large-scale map from "the Golden Age of American Mapmaking." 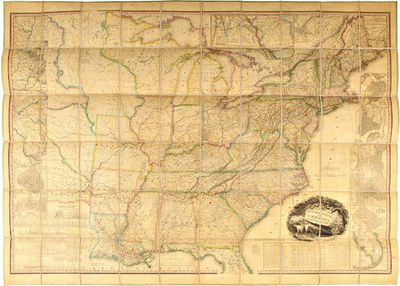 The 1829 first edition of this map is described by Rumsey as "one of the best early large maps of the United States and the premier map for its period" (Rumsey 975). The map shows the United States from the Atlantic ocean to what today is western Kansas (noted as "Kanzas" on map). To the west of Michigan Territory and Missouri large areas of land include the locations of numerous Indian tribes but are designated as "Districts" rather than Territories: District of Huron, Sioux District, Mandan District, Osage District and Ozark District. Also included are canals, railroads, "McAdamized" roads and proposed canals and railroads. One of the most attractive and interesting aspects of the map are the numerous insets: these include sixteen inset city and regional maps (Environs of Albany; Environs of Boston; Environs of New York; Environs of Philadelphia and Trenton; Environs of Baltimore and Washington; Cincinnati; Charleston; New Orleans; South Part of Florida; Washington; Baltimore; Philadelphia; New York; Boston; Pittsburgh & Environs; Oregon and Mandan Districts [8 x 13 inches, with a further inset 'Outlet of Oregon River']) the border of the main map also includes fourteen profiles of portages, canals, and railroads and two tables in the lower right corner: Statistics of the Western Districts, and Statistics of the United States. According to Tooley, H.S. Tanner is "thought to be the first native-born American to devote his career to publishing," and he is responsible for some of the most important maps of the United States to be published in the 19th century. AMERICAN IMPRINTS 40603. PHILLIPS MAPS, p.885 (ref). RUMSEY 975. STREETER SALE 3835 HOWES T28. RISTOW, pp.191-98. SABIN 94318. SCHWARTZ & EHRENBERG, p.253 ("Twice as detailed as Melish's map of 1816"). WHEAT TRANSMISSISSIPPI II, 390, p.94 (illustrated), p.96. Robert Cadell. Hardcover. Edinburgh, 1829-1836. 8vo, 88 volumes, contemporary polished calf. Finely bound by an unknown contemporary binder with spines in five compartments, gilt inlays at spine, gilt-tooled boards, marbled endpapers and page edges, morocco labels at spines. A remarkable complete set of Sir Walter Scott's works, published by Robert Cadell in Edinburgh. Complete in 88 volumes, including Scott's prose, poetry and novels. A near fine set, with most volumes showing some wear and loss to spine at heads and heels. A few stray scuffs and chips to bindings at spine. A few hinges tender but all holding, with no boards detached. Some minimal normal foxing to frontis and title pages, some light dust residue to tops of pages, contents generally fine. This complete set has turned up at auction twice in the last forty years, but never in a full leather contemporary binding. Please contact us for additional pictures or information. . Very Good. 1829. First Edition. Argyle Street [London, England], [1829-1832]. 4.5" x 7". 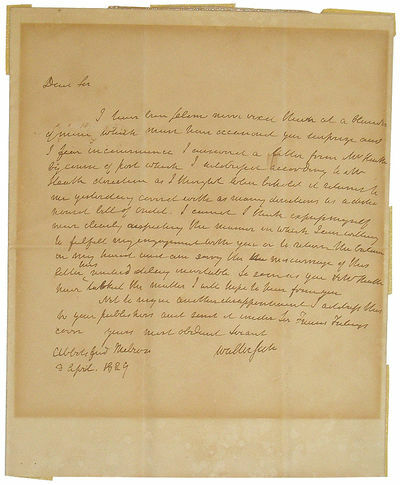 "Displayable Autograph Letter Signed ""Washington Irving,"" 1p, 4.5"" x 7"". Tuesday morning,[London, 1829-1832]. With integral leaf addressed by Irving to ""Dr Ferguson / 9 Queen Street / May Fair,"" with upper left corner attached to the red wax seal when it was opened by the recipient. Two mounting remnants. Fine condition.In full, ""I regret extremely that I am already engaged for Saturday. Nothing could have give me greater pleasure than to meet the party you mention - and I have quite a longing to make the acquaintance of Mr Adam Ferguson. 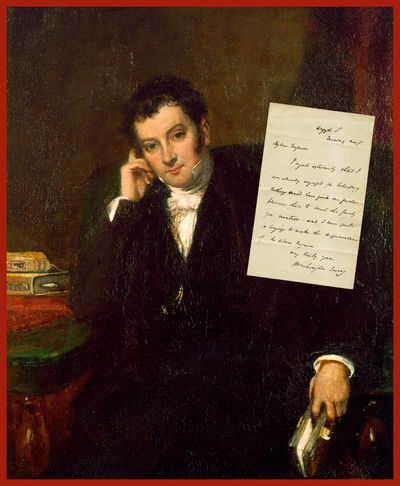 ""From 1829-1832, Washington Irving served as Secretary to U.S. Minister to London Louis McLane. During this time, Irving lived at 8 Argyle Street, Soho, London.Robert Ferguson (1799-1865) was an Indian-born Scottish obstetric physician. In 1831, he was appointed physician to the Westminster Lying-in Hospital and professor of obstetrics at the newly founded King's College. Ferguson was appointed Physician-Accoucheur to the Queen in 1840, in which capacity he attended, along with obstetrician Sir Charles Locock, at the births of all Queen Victoria's children. Robert Ferguson was grandnephew of Scottish philosopher and historian Adam Ferguson (1723-1816) whose son, Sir Adam Ferguson (1770-1854), Irving wished to meet." Lipsiae (Leipzick): Sumptibus Leopoldi Vossi., 1829. Fine. Sumptibus Leopoldi Vossi., Lipsiae (Leipzick) 1829, Grd in 4 (25,5x21,5cm), viii, 114. 4 pl., relié. - First Edition. Illustrated with 4 colored plates and 11 figs. shagreen posterior half black. Back with false nerves. Cold and golden threads. Between the title and editorial data, a rectangle 3 cm was cut, probably to remove a bookplate. Tail: Collège de France. 2 library labels on the back. Barkow (1798-1873) was professor of anatomy at the University of Breslau. His publications were rightly keymaps, including their illustrations. His correspondence with Darwin is well known. The book deals with the system of arteries in mammals. --- Please note that the translation in english is done automatically, we apologize if the formulas are inaccurate. Contact us for any information! - [FRENCH VERSION FOLLOWS] Edition originale. Illustrée de 4 planches coloriées et de 11 figs. Reliure en demi chagrin noir postérieur. Dos à faux nerfs. Filets à froid et dorés. Entre le titre et les données éditoriales, un rectangle de 3 cm a été découpé, certainement pour faire disparaître un ex libris. En queue : Collège de France. 2 étiquettes de bibliothèque sur le dos. Barkow (1798-1873) fut professeur d'anatomie à l'université de Breslau. Ses publications étaient à juste titre renomées, notamment pour leurs illustrations. Sa correspondance avec Darwin est bien connue. L'ouvrage traite du système des artères chez les mammifères. Paris: Ladvocat, 1829. Fine. Ladvocat, Paris 1829-1830, 13x21,5cm, 10 volumes reliés. - first edition. Binders full fawn glazed calf, back smooth ornate friezes cold stamped, gilded friezes heads and tails, richly ornamented boards of a wide-stamped decoration consisting of a border and a central panel designed by nets and a roulette foliage, boards struck at their centers a large cartridge diamond-stamped and decorated with a quatrefoil guards and contreplats of handmade paper, green edges, elegant English romantic bindings of the time. Some small foxing, lack head of a higher cap, slight traces of rubbing on some minor back, some corners bumped. Provenance: the Bloomfield Library with engraved armorial bookplate pasted and heads of contreplats. 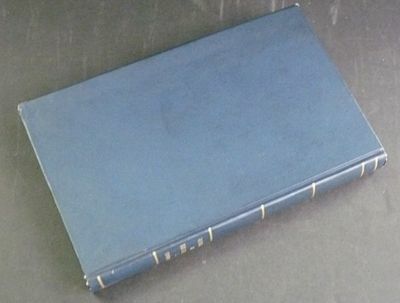 Very nice copy perfectly and beautifully set in an elegant romantic contemporary binding in full glazed calf. - [FRENCH VERSION FOLLOWS] Edition originale. Reliures en plein veau glacé fauve, dos lisses richement ornés de frises estampées à froid, frises dorées en têtes et en queues, plats richement ornementés d'un large décor estampé à froid consistant en une bordure et un panneau central dessiné par des filets et d'une roulette à rinceaux, plats frappés en leurs centres d'un grand cartouche en losange et estampé à froid agrémenté d'un quadrilobe, gardes et contreplats de papier à la cuve, tranches vertes, élégantes reliures romantiques anglaises de l'époque. Quelques petites rousseurs, un manque en tête d'une coiffe supérieure, légères traces de frottements sans gravité sur certains dos, quelques coins émoussés. Provenance : de la bibliothèque de Bloomfield avec ses ex-libris armoriés gravés et encollés en têtes des contreplats. Très bel exemplaire parfaitement et magnifiquement établi dans une élégante reliure romantique de l'époque en plein veau glacé. Paris: Ambroise Dupont & Cie, 1829. Fine. 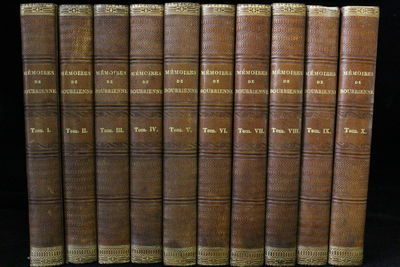 Ambroise Dupont & Cie, Paris 1829, 14x23cm, 4 volumes reliés. - Second edition, partly original, revised, corrected and augmented, one of the few copies on laid only leading copies. Binders half morocco Russian fir with corners, back with five nerves slightly discolored quintuple set with gilded nets decorated with ornate gilded coffered typographical motifs, golden friezes head and tails, framing a net gilded on the boards of marbled paper , guards and contreplats paper to the tank, the time bindings signed Bibolet. Good book full of his 56 boards including 4 frontispieces and its seven folding maps. All boards and cards are drawn and glued on China laid paper, which is characteristic of large paper copies. Very nice copy elegantly established by Bibolet in a romantic binding and uniform at the time. - [FRENCH VERSION FOLLOWS] Deuxième édition, en partie originale, revue, corrigée et augmentée, un des rares exemplaires sur vergé, seuls grands papiers. Reliures en demi maroquin de Russie sapin à coins, dos légèrement décolorés à cinq nerfs sertis de quintuples filets dorés ornés de caissons ornementés de motifs typographiques dorés, frises dorées en tête et en queues, encadrement d'un filet doré sur les plats de papier marbré, gardes et contreplats de papier à la cuve, reliures de l'époque signée de Bibolet. Ouvrage bien complet de ses 56 planches dont 4 frontispices ainsi que de ses 7 cartes dépliantes. Toutes les planches et cartes sont tirées sur Chine et encollées papier vergé, ce qui est caractéristique des exemplaires en grand papier. Très bel exemplaire très élégamment établi par Bibolet dans une reliure romantique et uniforme de l'époque. 1829. Used to Justify Secession Rawle, William [1759-1836]. A View of the Constitution of the United States of America. Philadelphia: Philip H. Nicklin, Law Bookseller, 1829. viii, -349 pp. Octavo (8-3/4" x 5-1/2"). Contemporary sheep, rebacked in period style retaining lettering piece. Moderate rubbing and a few light scuffs to boards, corners bumped and worn. Moderate toning, occasional foxing and faint dampstaining. Early owner signature to front free endpaper, interior otherwise clean. A handsome copy of an important work. * Second edition. Rawle's treatise is one of the earliest works on the United States Constitution, and one of the most important. This text is significant also because it suggests that states have a right to secede from the Union. As Cohen observes, the popularity of this text, which was used at West Point and other schools throughout the country, "is generally considered to have influenced the leaders and supporters of the Confederacy, although in fact Rawle opposed secession." Cohen, Bibliography of Early American Law 2894..
Edinburgh; Oliver & Boyd; Simpkin & Marshall, London; and Robertson & Atkinson, Glasgow. 1829. 4to., with 6 large folding lithographic plates, (2) + 15 + (1) + 2 + (2)pp., together with numerous additional blank leaves, in a fine later binding of half calf gilt over marbled boards. A fine copy sometime in the library of Charles Sebag-Montefiore with his armorial bookplate>. 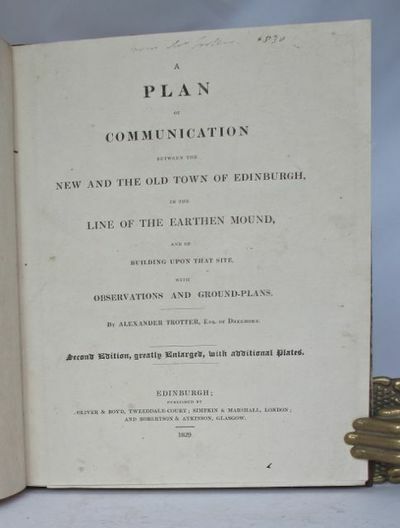 This was Trotter's detailed proposal for the levelling of the Mound, the construction on the Mound of a fine neo-classical shopping arcade, and the provision of a new road across the Mound linking the New Town and the Old Town of Edinburgh. The shopping arcade was evidently at the heart of Trotter's enthusiastic scheme. It would be truly multi-functional, providing not only a shopping experience to rival London or Venice, but also galleries for modern art, a shelter from the violent winds 'so prevalent in the Good Town of Edinburgh', an attractive rendez-vous for 'the Belles and Beaux', and the daily flow of 'Judges and Gentlemen of the Law, Professors and others connected with the University' would all 'contribute to the prosperity of the Shopkeeper'. The Arcade (which would have a sophisticated system of central heating) would more resemble the Burlington Arcade in London, or the Galleries of Paris, surpassing them all in situation, as every shop would have the double advantage of fronting a principal street, as well as in having a front into a Gallery so eminently calculated to attract the great population of Edinburgh'.The plates here not only give a detailed view of both the elevation and the plan of the proposed Arcade, but also fine lithographic perspective drawings of the Old Town and its proposed access from Princes Street. In fact, Trotter's designs were never implemented. Philadelphia, 1829 2 volumes. i-[x]-251 pages; 234+[6 ad] pages. Small octavo (7 1/4" x 4 1/2") bound in full leather with black label to spine in gilt lettering. (BAL: 3844) First American edition. Published in London first in the same year.Cooper was one of the most popular 19th-century American authors, and his work was admired greatly throughout the world. While on his death bed, the Austrian composer Franz Schubert wanted most to read more of Cooper's novels. Honoré de Balzac, the French novelist and playwright, admired him greatly. Henry David Thoreau, while attending Harvard, incorporated some of Cooper's style in his own work. Cooper was one of the first major American novelists to include African, African-American and Native American characters in his works. In particular, Native Americans play central roles in his Leatherstocking tales. However, his treatment of this group is complex and highlights the tenuous relationship between frontier settlers and American Indians as exemplified in , depicting a captured white girl who is taken care of by an Indian chief and who after several years is eventually returned to her parents. Often, he gives contrasting views of Native characters to emphasize their potential for good, or conversely, their proclivity for mayhem. Last of the Mohicans includes both the character of Magua, who is devoid of almost any redeeming qualities, as well as Chingachgook, the last chief of the Mohicans, is portrayed as noble, courageous, and heroic.Condition:Spine head chipped, exterior hinges beginning, old armorial book plates to front pastedowns else a very good set. Dramatische Werke von August von Kotzebue - 1. bis 120.Bändchen in 20 Bänden gebunden. Symbolae physicae seu icones et descriptiones Avium quae ex itinere per Africam borealem et Asiam occidentalem studio novae aut illustratae redierunt.
. Decas secunda. Off. Academica, Bln. 1829. 10 handkolorierte lithogr. Tafeln (Format 50,7 x 35,6 cm) in bedruckter Orig.-Mappe mit Schließbändern (diese mit Defekten). Minimal stockfleckig. - Nissen ZBI 1247, Rara, S. 138. - Sehr seltener Teil mit prächtig kolorierten Vogeltafeln des umfassenden wissenschaftlichen Berichts über Fauna und Flora der Gebiete entlang des Nils, der libyschen Wüste, der Küsten des Roten Meeres, Palästinas und des Libanon. Noch seltener als die anderen Teile, da dieser ohne Text geblieben ist und daher nie ausgeliefert wurde..
Organon der Heilkunst. 4. verbesserte und vermehrte Auflage. CONSTANTINOPLE in 1828: a residence of sixteen months in the Turkish capital and provinces : with an account of the present state of the naval and military power, and of the resources of the Ottoman empire. London, Saunders & Otley, 1829.FIRST EDITION 1829. 4to, approximately 275 x 215 mm, 10¾ x 8½ inches, 5 engraved plates, 3 hand coloured lithographs, 1 being the frontispiece, 1 plate of antquities in sepia and a double - page view of Constantinople lithographed on india paper and mounted on thicker paper, pages: xix, , 1 - 406, handsomely rebound in full modern morocco, 2 red gilt lettered labels, extra gilt spine, gilt and blind decoration to covers, marbled edges, new marbled endpapers. No half - title present, faint offset from text to colour plates, last 2 pages have a faint vertical crease, occasional dusty marks to margins, occasional pale age - browning, 1 plate has tiny nick to fore - edge, last 2 pages have tiny nick to bottom edge, otherwise a very good copy housed in a plain modern brown cloth slipcase. Some copies of early issues had an advert leaf at rear, not present in our copy. According to Atabey citing Abbey "an Appendix was published separately after the initial appearance of the first edition which is sometimes found bound in". Not present in our copy and not present in either the Blackmer copy nor the Atabey copy. See: The Ottoman World The Sefik E. Atabey Collection, 741; Sotheby's The Library of Henry M. Blackmer II, 798. Travel in Aquatint and Lithography from the Library of J. R. Abbey, 393. MORE IMAGES ATTACHED TO THIS LISTING. London Almanack for the Year of Christ 1830. London, The Stationers' Company, (1829).. 6 x 3,5 cm, 18 ungezählte Blätter. Mit 1 Kupferstich von H. Adlard nach T.M. Baynes. Goldschnitt. Orig.-Maroquin in Schwarz und Rot mit reicher Goldprägung im ebenso verzierten Lederetui.. Der Kupferstich geht über vier Seiten und zeigt eine Ansicht des King's Palace, St. James Park. Weiter enthalten neben dem Kalendarium: a table of Kings / Queens reigns, current coins, eclipses. - Deckel mit zwei kleinen Schabstellen im Leder. Sehr schönes Exemplar. Offenbach a/m: J. Andr? Offenbach a/m: J. André. [March 1829]. Oblong folio. Modern half black leather with marbled boards, original rectangular printed label inlaid to upper. 1f. (title), [iii] ("Vorbericht" by Ant[on] André dated "March 1829" with plate number 5200 to lower right corner), [i] (blank), 28 pp. Lithographed. Printed in red and black as noted in the Vorbericht. 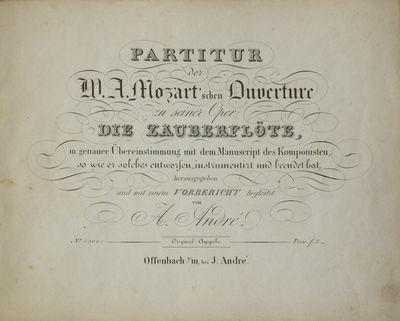 With handstamp "Hamburger ?-ffentliche Bücherhallen Musikbücherei" to verso of title. . First separate edition of the full score. Köchel 6, p. 711. Hoboken 12, 573 (with extra leaf containing trombone part bound in). Not in Hirsch. RISM M4803 (4 copies, with only one in the U.S., at the Library of Congress). Worldcat (5 copies, none recorded in the U.S.). 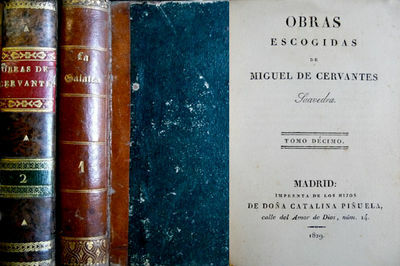 An early example of a critical edition. 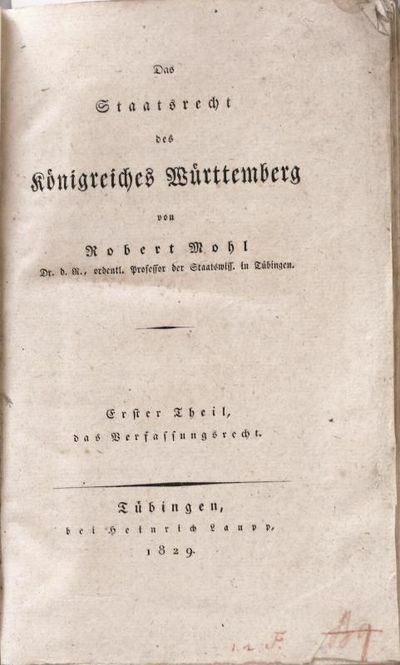 The Vorbericht foreshadows scholarly editorial procedures becoming common in the later nineteenth century; the printing in two colors and the inclusion of deleted measures (printed complete with deletion) look even further ahead. Paris: Vezard & Cie - Barba, 1829. Fine. 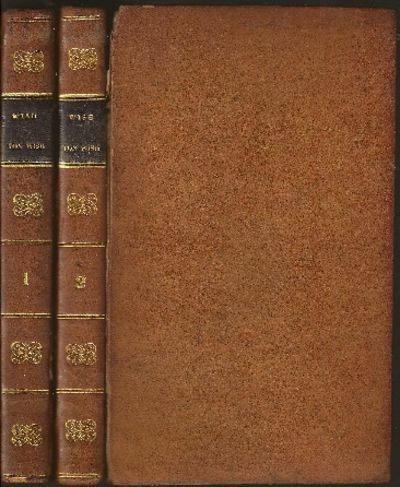 Vezard & Cie - Barba, Paris 1829 - 1830, 12,5x21cm, 2 volumes reliés en 1. - first editions. Binding to bradel open marine cardboard, flat spine decorated with gilt. It lacks a sheet listing the beginning of the second volume is, against, although full of folding lithograph Charlet. Some small foxing mainly affecting the latest pages of the second volume, otherwise nice copy. --- Please note that the translation in english is done automatically, we apologize if the formulas are inaccurate. Contact us for any information! - [FRENCH VERSION FOLLOWS] Editions originales. Reliure à la bradel en plein cartonnage marine, dos lisse orné de filets dorés. Il manque un feuillet d'annonce en début du second volume qui est, par contre, bien complet de la lithographie dépliante de Charlet. Quelques petites rousseurs affectant principalement les toutes dernières pages du second volume, sinon agréables exemplaires. Tübingen, Laupp 1829 - 1831.. 2 Bände. XVI, 693 S., 1 Bl. ; XIV, 1007 S. Blaue marmorierte Pappbde. d. Zt. mit etwas Rückenverg. und rotem goldgepr. Rückenschild. Heyd I/1453; Stintzing-L. III/2, 405 ff. - Erste Ausgabe. - "Das erste grosse selbstständige Werk Mohls, womit er bis auf unsere Tage der Bearbeitung eines positiven dt. Landesstaatsrechts Muster u. Vorbild gegeben hat." (ADB XXII, 745). - "Nicht nur die erste gelungene wissenschaftliche Bearbeitung eines positiven, konstitutionellen Staatsrechts überhaupt, sondern die erste gelungene wissenschaftliche Bearbeitung eines modernen Staatsrechts schlechthin" (Stintzing/L.). - Robert Mohl, seit 1837 von Mohl (1799-1875) gilt als derjenige, der die weite Verbreitung des Begriffs "Rechtsstaat?" auslöste, den er aber gerade nicht dem "aristokratischen?" Polizeistaat entgegensetzte. Er war Gegner des allgemeinen Männerwahlrechts und der Republik als Staatsform. - Die hübschen Einbände etwas berieben. Unbeschnittenes, nur wenig stockfleckiges Exemplar! Abbotsford, Melrose: April 9, 1829 Single leaf, handwritten ink; with the original envelope, handwritten in brown ink, with the original red sealing wax. Good, with some light creasing and minor splits at the page folds, some toning to the recto, light spotting and tape reinforcements to the versos. Overall, a clean and unsophisticated letter, written by Scott at his home at Abbotsford. Scott addressed this letter to Frederick Mansel Reynolds, son of the noted dramatist Frederick Reynolds and editor of the yearly literary magazine The Keepsake. Notably, Charles Theodosius Heath, the founder of Keepsake, hoped to employ Scott as the editor, but Scott declined the offer, choosing instead to contribute three shorter stories to The Keepsake of 1829, which are collectively known as "The Keepsake Stories:" "My Aunt Margaret's Mirror," "The Tapestried Chamber," and "Death of the Laird's Jock." This letter is accompanied by an engraved portrait of Scott by renowned Scottish engraver John Horsburgh after a painting by Sir Thomas Lawrence. This steel engraving was published in Philadelphia by Gebbie and Barrie circa 1876. Notably, this line engraving employs a mixture of engraving and etching to create rich details and a sense of depth without any tonal processes.. Good.